I enjoyed writing last weeks update (week 13) that I thought I would write another one. I guess they are a good way to recap on what we get up to as a family. We have been reviewing a National Geographic Geodes set. The boys don’t seem to review as much anymore so they were grateful for something new to try out. There was a point when they were younger that it did get ridiculous, they would end up with new toys every day! Least with less reviews they are more grateful for what they do get. Youngest wanted to paint stones again. Although I think he likes it too much now to hide for anyone to find. It was quite relaxing painting in the sun! Well that was until he shook the POSCA paint pen so vigorously with the lid off that he got covered in paint. I am hoping we can salvage his clothes. But I am still pleased he decided to be creative. I managed to have a little win. So I am happy even though I still haven’t entered many so far this month. A nice bottle of wine and some choccies are on their way to me (so I can share with my mum!)! I need little treats like this as it has been a long term getting to Easter with one drama after another. I keep feeling like I need to dedicate more time to comping, I do find it weirdly relaxing! But I have been doing a bit more blog admin behind the scenes. After google+ finished I had a lot of broken links so that was quite an effort getting sorted! Now it is done it should free up more time for competitions again. Well we have had a quote and it’s a bit higher than we hoped but if we have a couple of leaner months, we should get right quite quick! It will make winter so much more bearable here, uour dining room is the heart of the household and it could do with being cosier. 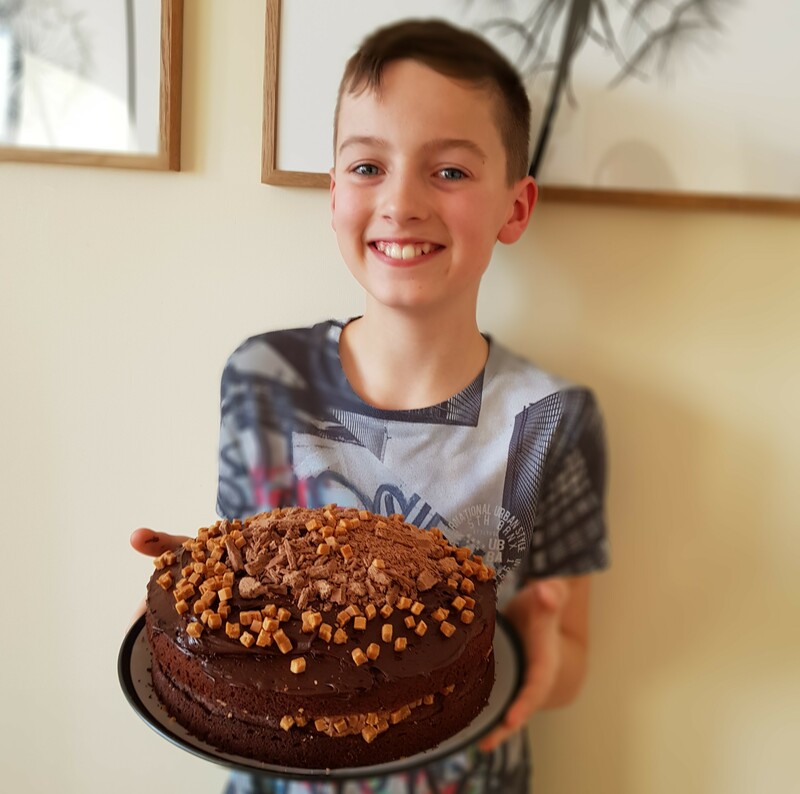 My eldest wanted to do more baking so this week with his dad guiding him he made an amazing chocolate cake covered in sprinkled Flake and fudge pieces. He also wanted to make double decker filled brownies too. They were so gooey and tasty! I hope he makes more of a habit of baking these decadent treats are a BIG step up from shop bought cakes. Mind you the kitchen looks like a complete mess I think I will need the sugar from those treats to find enough energy to tidy it! We went out for a lovely meal with friends. We are three couples and don’t always manage to get out as a full group very often. The food was amazing and I hope we can eat there again soon! I had chicken and king prawns. I loved everything so much I made a point of squeezing in three courses even though I was quite full. That chocolate cake looks amazing! Big well done to your eldest, I’m sure Mr Holywood would give him a handshake. And congrats on your wins! I’m not entering much these days, kind of lost my comping mojo. The geodes set sounds great. It is rubbish with older kids that there isn’t so much to review but my girls are always so grearful! The National Geographic Geodes sets look fab! Well done on the competition win. I need to try harder. I have not really tried for the last few moths. The double decker filled brownies sound AMAZING! well done the cake looks amazing. Yes I use to find when the older two were young we got more toys and games than you can shake a stick at.